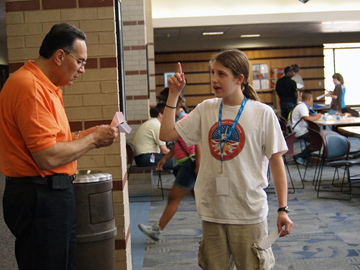 A student participant in the Tulsa Alliance for Engineering summer camp describes his paper airplane design to Dr. Ken Ede, assistant dean of OSU's College of Engineering, Architecture and Technology. Measuring drag force in a wind tunnel and building solar cars are not typical summer vacation activities for middle school students. Forty Tulsa seventh- and eighth-graders will have these and more stories to share after completing a weeklong Tulsa Alliance for Engineering summer camp. Students, hand-selected by their math and science teachers, took a behind-the-scenes look at some of Tulsa’s largest engineering facilities, met engineers and learned about career options. During the camp, students visited all six of the educational intuitions that make up the Alliance – Tulsa Tech, Tulsa Community College, Oklahoma State University-Tulsa, University of Oklahoma-Tulsa, Oral Roberts University and The University of Tulsa. Participants visited OSU-Tulsa on Wednesday to learn about engineering programs and complete a paper airplane experiment. American Airlines and the Tulsa Air and Space Museum partnered with OSU-Tulsa for the event and also provided tours for the students. The goal of the Alliance is to increase the number of engineering graduates for Tulsa and northeastern Oklahoma.